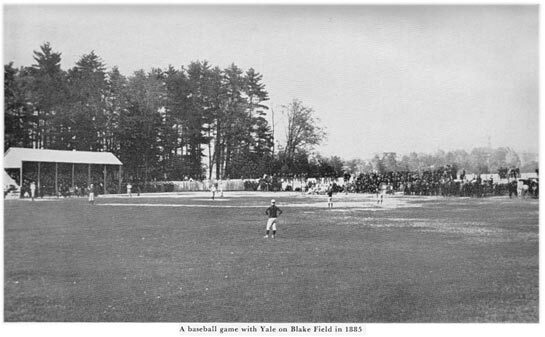 Blake Field was cleared in 1877 thanks to the effort of Lucien Ira Blake of the Class of 1877, a student who felt strongly that the College needed a better field. Students had been using the Hampshire County fairgrounds up to that time. With the help of Charles Pratt, Blake arranged for the area south of the present Pratt Field to be cleared, and the field served the College for four years, until 1881, when the Massachusetts Central Railroad laid tracks through it (King, 85). The second Blake Field, beyond the Observatory on Snell Street, was purchased from Professor Harris in 1888 (King, 85). It is pictured here from "The Consecrated Eminence" (101).